Greetings fellow Hashers and Harriets it is now getting close to our BIG event and we are all ready to welcome you to what we are sure to be a Hashtastic event. The week will kick off on the Wednesday 15th May with the spectacular “Caminito Del Rey” (The Kings walk) arranged for us by “Rubens Travel” Your tickets and more information will be available at the Hotel on the Tuesday evening: Look for “Streaky” at the “La Tren Bar” behind the Hotel reception desk, she will be there from 17.00 hrs till 19.00hrs for ticket collection, advise on the coach pick up time and any questions you may have. If you are not going to be able to collect your ticket at this time please email us and we will arrange another way to collect your ticket. For your information “Rubens Travel” is located very colose to the Palmeras Hotel, Calle Jacinto Benavente 5, Tel: 951 236 765 (info will also be available our web page and at the Hotel). On Thursdsay 16th May we have the Red Dress run. Registration will be at the Hotel Palmeras at 10.30 in the “Colon Hall” and the coach will leave at 12.30 for the run. The run will be around the village of Mijas with an On On venue back in Fuengirola. Please turn out in your best Red dress attire, All will receive commeorative keepsake and plenty of Beer. More information can be seen on our web page. Will be held at the Hotel Palmeras in the “Espana Hall” followH-H-H” signs from the Hotel lobby, or follow the crowds. Doors will open at 17.00hrs, get yourself registered, collect your “Goody bag” and choose your Run, ALL the runs and the Hares will be there to help you in your choice, once that is done relax and have a few beers or wine, snacks will be served through out the evening. Registration will close at 21.00hrs. After registration you can then make your way to “Pogs” Irish pub”, where you will be offered a complementary drink and can enjoy the live music and friendly atmosphere, or try the Hash Bar “The Office” just opposite Pogs, with Pool tables great food & Beer. Important Information: To hopefully make the runs and circles more manageable and enjoyable we have increased the runs to 6 locations and limited each run to 55 hashers, we have also colour coded all the runs to make it easier to locate the correct coach allocated for your run on the Saturday. All the hares will be at their respective registration desks 1 to 6. If you have any queries or require more information on the run ask the hares. Choose your run, collect your coloured wrist band and please get on the corresponding coloured coach on the Saturday. Information on the coaches will be given to you when you register. It is on a first come first served basis for the spaces on the coaches. Don’t be disappointed if your choice of run is full as ALL the runs are set in beautiful countryside and we are sure that whichever run you end up on will be memorable. You can exchange your colour wrist bands with other hashers, but we will be monitoring the coaches to ensure that the correct colour wrist band gets on the correct coloured coach! Due to limited parking space in front of the Hotel coach arrival times will be staggered: First will be the Ball breaker, then every 10 minutes. All coaches will be leaving from in front of the “London Pub” directly in front of the Hotel, please wait for your coach in the designated area in front of the Hotel. Your help and support to make this work will be appreciated, please work with the “Coach monitors” when getting on your designated coach. All coaches will have cold beer, soft drinks and water and this will be available before and after the run, including the circle (No drinks are permitted on the coaches during transit) and snacks will be provided at the circle, including sandwiches. We will not run out of cold beer! Please note: Due to a high fire risk smoking is not permitted on any runs. 1) The Ball Breaker Run (Black run): This is a fantastic run with spectacular views from the peaks of the Mijas mountain’s to the coast and over to the Atlas mountains in Africa. It is not for the faint hearted or anybody suffering from vertigo. Don’t think about it unless you are fit as the run is approximately 16 km long. The coach to this run site is approximately 30 minutes. 3) Ardales The river Run (Yellow run): The Andalucía country side at its best and the next longest run after the Ball breaker. The run is approximately 45 minute drive from the Hotel. The village of Ardales is another beautiful white village with its own castle. The run starts on the surrounding hill side and makes its way through the country side along a river with great pools giving you a chance to cool off. It’s a great trail with only one hill and picturesque views over the mountains and the El Chorro lakes. The run is approximately 10 km. 4) Tolox National park run (Orange run): This run offers stunning Mountain trails with a few hills around the National park close to the village of Tolox, which is a small town known for its healing natural springs! This run is a 50 minute drive from the Hotel. This is a perfect hashing area with great trails, stunning scenery. Excluding the ballbreaker this is the longest run measuring approximately 10 km in length. 5) Almogia River & mountains Run (Blue run): This will be a run in the true “hash meaning” of the word including a “swim” for the adventurous but the Hares will advise on a dry route to by-pass the aquatic challenge for none swimming Hashers. This run is located is spectacular country side and is not too challenging and will finish in a fantastic area on the banks of the river. This run is approximately 9kms and the coach ride to this run site is 45 minutes. 6) Alora moderate Run (Purple run). The Hares have found you another really fantastic run, close to the village of Alora. This is another white village which offers stunning scenery and amazing rock formations as you make your way around the run, guaranteeing that you will want to come back to explore at a later date. You will not be disappointed on this run. This run is approximately 8 kms and the coach journey will take about 40 minutes to arrive at this run site. Coaches for ALL runs will be leaving from in front of the Palmeras Hotel, Please look for the colour coordinated coach monitor for your run. This event will at the Palmeras Hotel in the “Colon Hall” on the first floor of the Hotel, follow the “H-H-H” signs. This is going to be one great party! 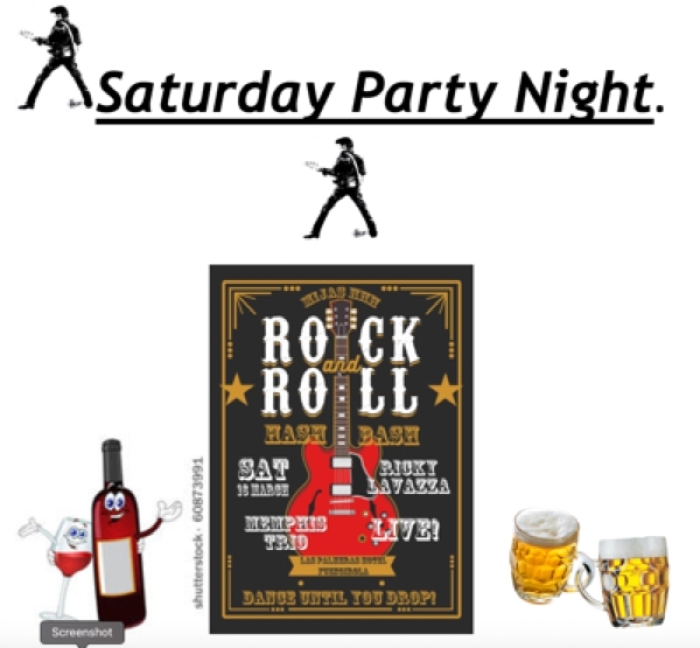 We have two of the Coast`s best Rock & Roll performers: “Ricki Lavazza” and the “Memphis Trio” on stage to Rock the night away, plus support acts and a DJ. Doors will open at 19.00hrs. The night will start with a 3 course sit down meal, with free flow of wine and beer during the meal, after the meal an open bar will operate with wine and beer until 24.00hrs. If you have a “Hash act” please let us know and we will get a slot organised. There will also be prizes for the best dressed Male, Female and couple, so get your Hash glad rags out and party. We will be meeting in the Fuengirola Port car park, which is opposite the Hotel Palmeras, (Follow the chalk arrows) the run will start at 12.00 hrs, there will be a long – medium & short Run all the runs will leave from the port. Note: Please turn out in your 30th Commemorative tee shirt. It will be an A to B run and you will be out all afternoon so bring whatever you may need for after the run. There will be a Bag drop off point if you want your bag transferred to the end of the run. At the finish venue there will be a sit down meal provided, a Spanish Horse Show and Flamenco Dancers, should you wish to party on there will be live music with free flow wine and beer till 21.00hrs. We have arranged a coach service running back to the Hotel from the finish venue. Coaches will leave every 30 minutes from 18.00hrs back to the Hotel last coach will be 21.00rs. 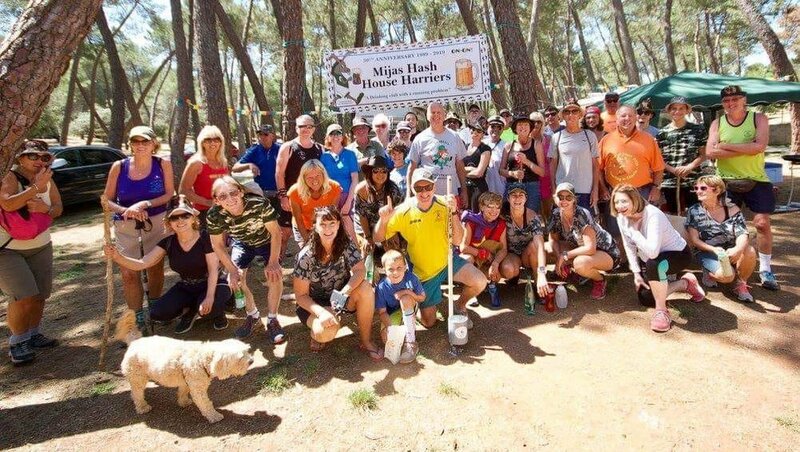 On Monday 20th is the turn of “Malaga H3” (The Boquerón Hash) to entertain you all in the fantastic City of Malaga (Mini Barcelona). Information on this run will be available on the Friday night registration night and on our web page. For those still alive on Tuesday 21st is the amazing “Gibraltar Rock Run” This is“Stiffanny” & “Streaky`s” infamous run around the Rock, ifyou have been lucky enough to get on this run you will not be disappointed, there will be a help desk on the registration night to get more details and information on this amazing run. We are looking forward to welcoming to our 30thAnniversary Bash.